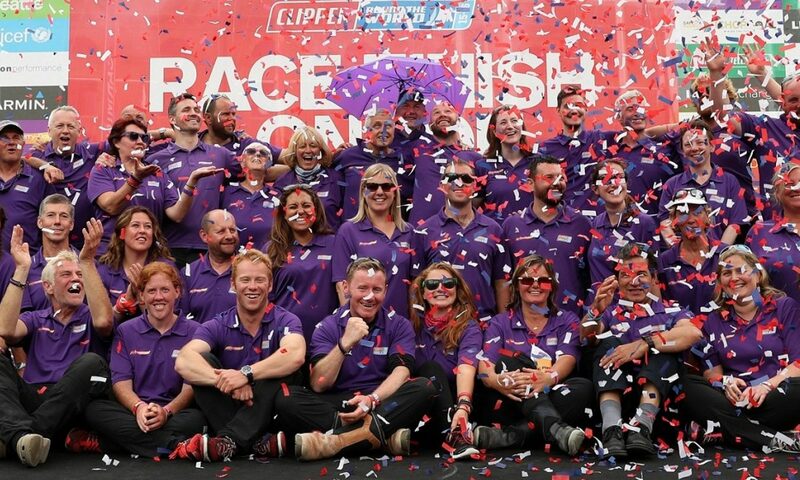 The next morning, we were lucky enough to have Mark Light, the Deputy Race Director and Skipper of Derry-Londonderry, join us for the day. 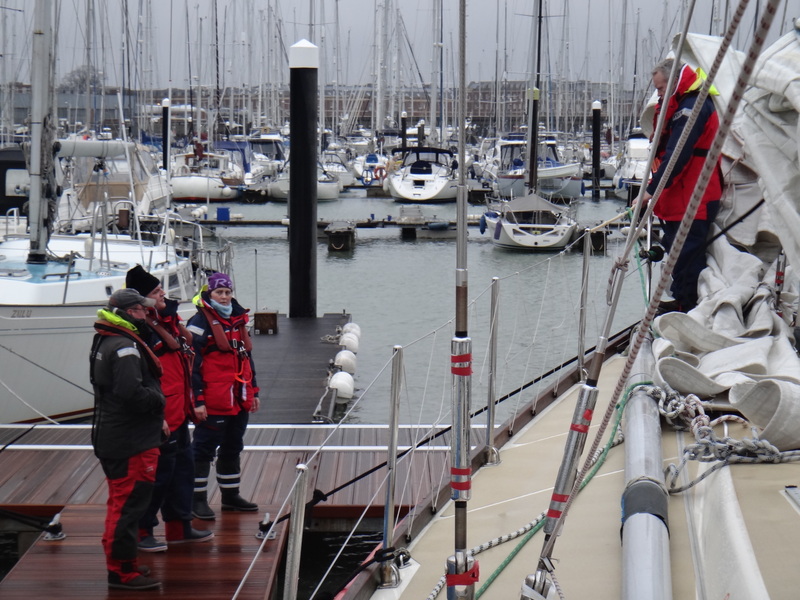 It was another dull, wet and very windy day but we were all looking forward to another day’s sailing and a chance to improve on our dismal man overboard performance off the day before. 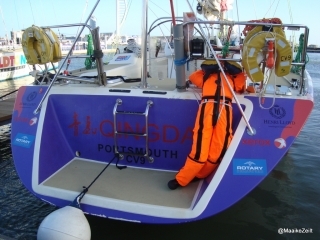 You may have noticed in the photographs the orange safety lines that are clipped to our lifejackets most of the time, with the other end clipped to the jackstays (a taut webbing strap stretching the length of the deck) above certain boat or wind speeds, at night, or if we want to or are told to. By clipping onto these lines, we reduce the likelihood of falling overboard or being swept from one side of the deck to the other. As you can see from this video taken when we were working on the foredeck in rough weather, the lines are not just there for show and do give you a certain level of confidence when you are in more exposed areas of the deck like the foredeck. The downside to using the line is that it makes moving around on deck more difficult, especially if you are trying to get past a number of people who are clipped onto the jackstay ahead of you. During a man overboard incident, if you are the person who is spotting the person in the water and it is your sole duty to keep your eyes on them at all times, being clipped onto the boat makes this job nearly impossible without some extra help. Can you see where this is going yet?! If we thought our drill from the previous day was abysmal, things were about to get a whole lot worse. Dobie was sent overboard and, being the person who saw Dobie going over, I became the spotter. This was fine for the first 20 seconds until I got my lifeline caught on something on the deck and I was stuck in one spot. Not long after, I lost sight of Dobie. To compound the problem, none of the extra gear had gone overboard to help us find the person in the water – there is a float with a flag that can be easier to spot in the water than the person, as long as it is thrown over the side. The end result… we lost Dobie. Luckily enough for us, somebody had remembered to press the ‘Man Overboard’ button on the chart plotter when they had gone down below to turn the engine on, so we had a rough idea of where Dobie had gone overboard. The only thing we could do at this point was to start a search for Dobie using an expanding square search – after what felt like an eternity, but was probably only 20-30 minutes, Dobie was spotted in the water and finally brought back on board. If that had been a real person, they would have been in a very bad way. The only positive we could take from the experience was that we did eventually find Dobie in the water – it was surprisingly hard to spot a bright orange and yellow ‘person’ floating in the sea with the waves and weather conditions we were experiencing. I also think those drills made us think a bit more about our own safety and that of our fellow crew members a bit more, just in time for our planned overnight sail the following day. 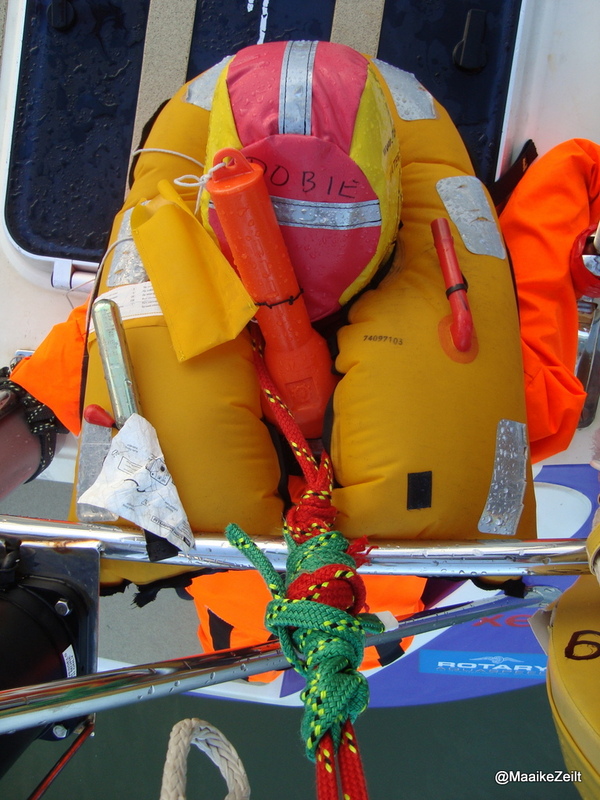 So with Dobie back in position, secured to the rails on the stern of the boat, we headed into Cowes.